It's like a one-sided Spike Cannibal, albeit your side, and you can choose not to feed him anything. So, really, not like Spike Cannibal at all. 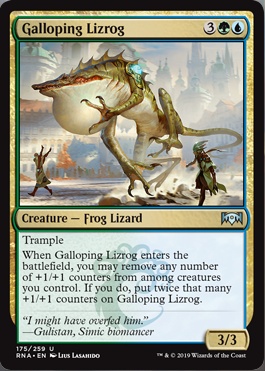 This makes me want to build a silly Temur deck where I try to make this a 21+/21+ and then Thud it at my opponents face for lethal. This card will 100% see constructed play. And of course in Temur you always have the backup plan of giving it haste, possibly through Riot. Rhythm of the Wild, probably contributes several of the +1/+1 counters in the process. Oh, I see. This is intended to enable a second triggering of my creatures Monstrosity ability. Err, Adapt. Yeah, Adapt. So different from Monstrosity. It's OK I guess, but most people are going to be afraid of his 3 toughness and therefore his vulnerability to Bolts.